How do I schedule a budget change? Budget Change Schedules are a great way to increase ROI by upping the ante or scaling back on ads during certain days throughout the week. 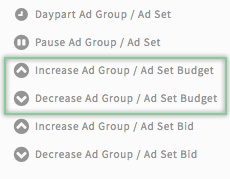 In this article, we'll cover how to set up a scheduled budget change in AdStage. Setting up a budget change schedule in AdStage is an easy way to save time and money. Simply input the day(s) of the week for which you want the budget change to apply, then input the change you'd like to take place. You will have the option to receive an email detailing the results of your scheduled budget change each time it runs. What are some common ways to change budgets on a scheduled basis? Adjust budgets based on competition: Notice that there are fewer competitive ads on the weekends? Set a schedule to decrease your campaign budgets on Saturdays and Sundays to increase ROI. Adjust budgets based on traffic: Does your site get more traffic toward the middle of the week rather than the Mondays or Fridays? Schedule a budget increase Tuesday-Thursday to capitalize on the time of the week when potential customers are searching for you most often. How do I set up a Budget Change Schedule? Step 5: (Optional) add an "if" condition (ex: campaign name contains "brand"). (a) Select the amount you would like to increase or decrease the budgets. You can use a static value or you can use a percent. (b) *Optional* Enter a Max (Increase schedule) or Min (Decrease schedule) Budget Value. For this, we will only increase or decrease the budget towards the limit, and will not go above or below. Step 9: Click Preview or Launch to save your schedule. Automate adjusts the type of budget you set up when creating the campaign. If you are using a daily budget Automate will adjust the daily budget. In the same vein, if you are using a lifetime budget Automate will adjust the lifetime budget. If you are using both a daily and lifetime budget, Automate will use the daily budget. Want some help getting started? Check out our Scheduling Templates here.